Don’t worry, Jen! WE’RE HERE TO CELEBREATE YOUR JOY WITH YOU!!! Yay!!! So awesome! Jen deserved an early win! Many people would have given up the idea of reaching 50k in your position, but I heard you once wrote a whole novel during the last week of NaNo. And that you once wrote 50k in a day. These may be exaggerated legends, but I’ll bet you’re still going for the win. Now…let’s see her finish it. Now that she’s got the time to do it right. I’m just commenting in that now that she has a week plus to take care of stuff, she can figure out if what she has is how she wants to end. Remember, reaching 50,000 just means that – you’ve typed 50,000 words. 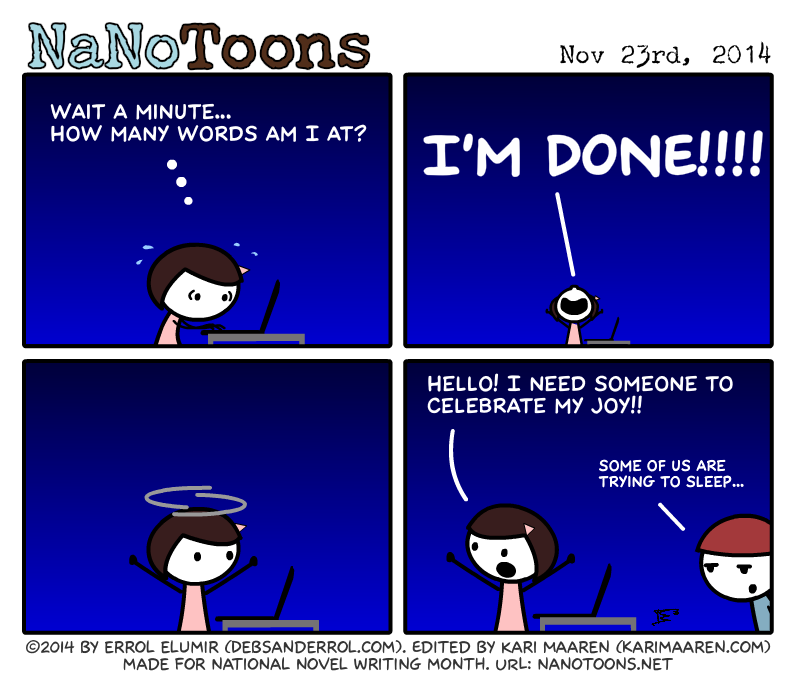 I know that from the one time I actually WON Nano (when you reach 50,000 on the last day, you’re just glad to have reached 50,000; ending or no ending.). Celebrate!! Huzzah! I love celebrating! I totally forgot they were at the overnighter. You broke 2 patterns–she won early instead of at the last minute, and she didn’t pass out early and write very little. That makes me sad though; if she couldn’t find someone around and awake to celebrate her win with her, what good is having an overnighter? Heh, yes, all the patterns broken! It was good because we were discussing this in chat with Manda and Kari and I wasn’t too sure how to handle the final week. Yay! Great shout of celebration for finishing!